The primary objective of the voyage of HMS Endeavour between 1768-71 was to assist the Royal Society in making astronomical observations from Tahiti. However, the greatest achievement of the voyage was the survey of the previously unknown east coast of Australia. 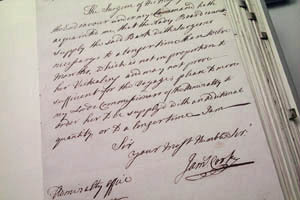 The item shown here is a letter from James Cook to Philip Stephens, Secretary of the Admiralty. It asks for mathematical instruments and stationery for use on the forthcoming voyage. Cook claimed the eastern part of Australia for Britain in 1770, and it was initially used as a penal colony. In 1829 Britain claimed the whole of the continent. Increasing degrees of self-government followed, but it was not until 1986 that British intervention in government was formally abolished.